I used a lamb leg here, but I've also made this using lamb t-bone. Both are incredible! Give it a try. Lamb might become a new favorite at your house. 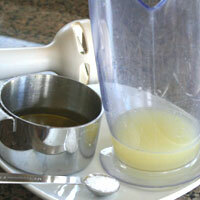 See Citrus Marinade for more detail. 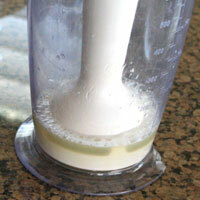 Squeeze the lemon juice into a blender or food processor. 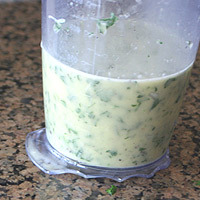 With the motor running, add the olive oil in a steady stream. Add the salt and pepper and mix. Pour into a plastic bag that is large enough to fit the meat. Set aside. Chop and measure the onion. 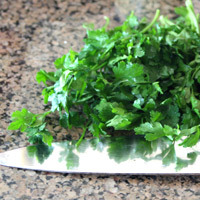 Chop and measure the parsley. 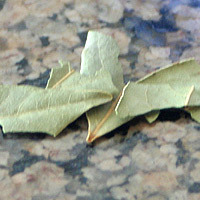 Crumble the bay leaf. Add all three to the lemon mixture. Mix them in the bag. Set aside. Rinse the meat and pat dry with paper towels. Add the meat to the marinade. Coat evenly. 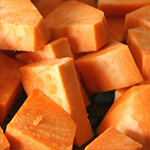 Marinate at least 15 minutes at room temperature or up to 8 hours in the refrigerator. I recommend 2 hours marinating time in the refrigerator. This is enough time for all the flavor and tenderness it needs. Don't marinate it for more than 8 hours in the refrigerator. 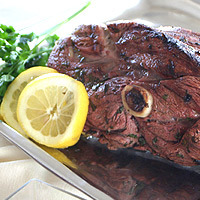 The lemon juice eats away at the meat and partially cooks it. The minimum is 15 minutes. It's really not enough time for maximum flavor, but in a pinch it will still work. Heat a charcoal or gas grill to high. Charcoal will give it a smokier flavor which is really good with this meat and marinade. Both work great though. 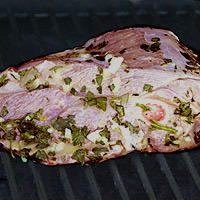 Lamb leg- place meat on hot grill. Cook 4-6 minutes, turn and repeat on all flat sides. Lower heat on the grill and cook until cooked through, about 10 minutes more on each side. Remove from grill and allow it to rest 10 minutes. 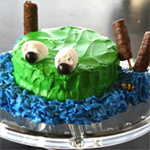 Slice and serve! It is really hard to estimate grilling times. It depends on the thickness of the cut of meat and the temperature of your grill. If using a charcoal grill add time to the estimates. Tough meat- typically when grilling you only want to turn the meat once. With a larger cut like a lamb leg this isn't possible. Turn it gently and not more than twice per side. Marinating times- see note for this. If the meat lacks flavor or tenderness. Marinate it longer next time. 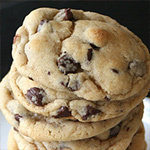 Overcooking- overcooking meat will leave it dry and tough. 1. 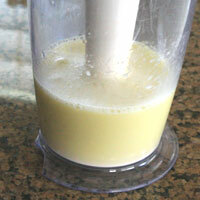 Squeeze the lemon juice into a blender or food processor. With the motor running, add the olive oil in a steady stream. Add the salt and pepper and mix. 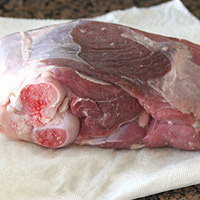 Pour into a plastic bag that is large enough to fit the meat. Set aside. 2. 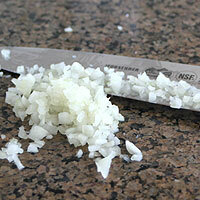 Chop and measure the onion and parsley. Crumble the bay leaf. Add all three to the lemon mixture. Mix them in the bag. Set aside. 3. Rinse the meat and pat dry with paper towels. Add the meat to the marinade. Coat evenly. 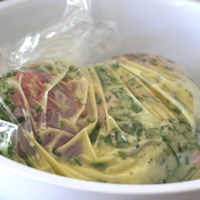 Marinate at (1)least 15 minutes at room temperature or up to 8 hours in the refrigerator. 4. Heat a charcoal or gas grill to high. Charcoal will give it a smokier flavor which is really good with this meat and marinade. Both work great though. T-bones- heat grill to high. Add meat and lower to medium and cook 4-6 minutes depending on the size. Turn and cook until cooked through 4-6 minutes more. 5. Remove from grill and allow it to rest 10 minutes. Slice and serve! 1. I recommend 2 hours marinating time in the refrigerator. This is enough time for all the flavor and tenderness it needs. 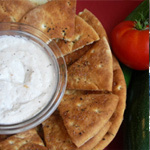 Don't marinate it for more than 8 hours in the refrigerator. The lemon juice eats away at the meat and partially cooks it. The minimum is 15 minutes. It's really not enough time for maximum flavor, but in a pinch it will still work. 2. It is really hard to estimate grilling times. It depends on the thickness of the cut of meat and the temperature of your grill. If using a charcoal grill add time to the estimates.